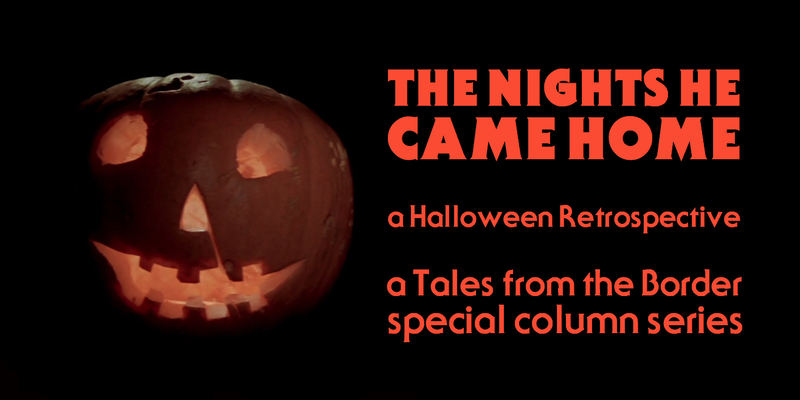 Welcome to the inaugural post of The Nights He Came Home – A Halloween Retrospective! Over the course of October this new special column, in which I revisit all of the original Halloween films in anticipation of that most spooky season, will be running every Monday and Thursday. Then, beginning on the 26th of October, daily posts with the unifying theme of the horror genre will be posted, leading up to an article on my choice of the 10 greatest horror films ever made. Today we kick things off with a look back at the film that started it all, Halloween (1978). Right from the offset it’s clear that Halloween wears it’s indie roots on its sleeves. The lack of an orchestral score and the use of a synth one, actors that obviously haven’t had that many lessons, and a villain that looks like they spent maybe 10 dollars getting the costume together for. However, it is the indie roots of the film that forces it’s mastermind, John Carpenter, to be so creative; it is the indie roots of the film that makes it so good. Whilst later Halloween films would get bigger budgets, none have the bite that the original has. In its simplicity can be found the key to its brilliance. Michael Meyers stalks student Laurie Strode throughout the film. The story is that of the archetypal slasher film, because Halloween is the original slasher film. Or, at least, the film that fully kicked off the genre. Michael Myers killed his older sister when he was six-years-old on Halloween night in 1963. He is then sent to a sanitarium, and escapes fifteen years later, returning to terrorise his hometown of Haddonfield, Illinois on Halloween night. He locks his gaze on high school student Laurie Strode (Jamie Lee Curtis), the virginal, smart protagonist of the film. Dr. Sam Loomis (Donald Pleasence), Myer’s psychiatrist, follows Myers to Haddonfield to stop him from killing everyone. The film is basically an hour of watching Myers stalk his prey and then the final half hour is Myers making his move. It’s a simple and effective story, and prime real estate for a low-budget indie horror feature. John Carpenter creates one of cinema’s greatest villains in Michael Myers. Michael Myers (Nick Castle) is, without a doubt, one of the greatest horror icons of cinema. He’s a particular favourite of mine because of just how limited he is in interaction. You never see him running, only ever walking; you very rarely see his face; and he never, ever, speaks. Because of these three simple facts, Myers is a palpably creepy presence whenever he appears. He is an archetype of pure evil, and because of that I think he is one of the very best slasher villains, if not the best. Donald Pleasence’s Dr. Loomis is a highlight of the film. 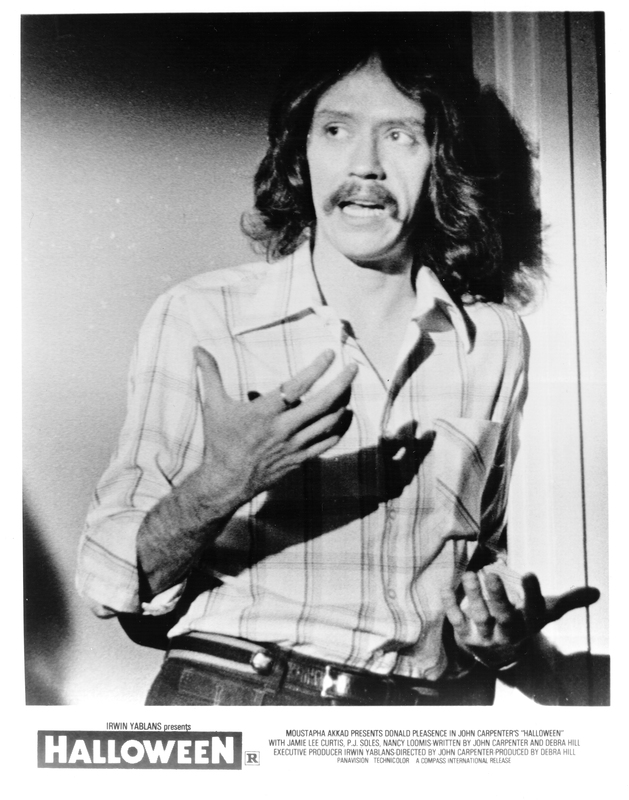 John Carpenter on the set of Halloween in a rare publicity shot for the film. This brings me to the screenplay, written by John Carpenter and Debra Hill. 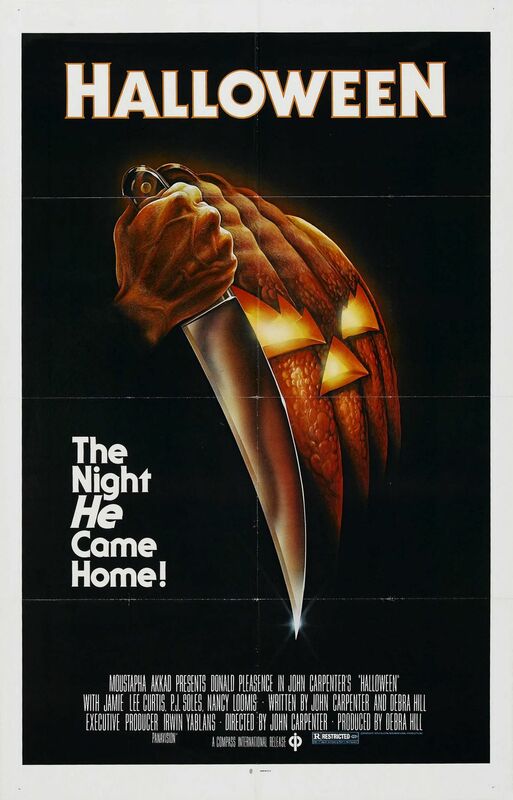 Debra Hill wrote all of the female dialogue of the film, while John Carpenter wrote all the dialogue concerning the search for Michael Myers, as well as Pleasence’s deliciously creepy monologues. Multiple details concerning the town and its residence were taken from Carpenter and Hill’s childhood. The screenplay is a brilliant exercise in economic writing. The final film clocks in at just over 91 minutes, and much of the tension is derived from the excellently paced and plotted screenplay. There is no superfluous detail; we spend just enough time with the characters before the killing starts to get a sense of who they are, so that when the killing does start it feels that much more horrifying. More films should take note of Halloween’s screenplay and timing; with films becoming longer and longer, now clocking in at the regular 2 hour mark, I think its time to look at just how brilliantly executed Halloween is in just 91 minutes. John Carpenter’s synth score is also brilliantly conceived. The main theme is easily one of the most iconic in horror cinema and creates a certain edge and flavour unique to the film. More importantly, Carpenter also knows when to leave the music out; there are many, many moments in the film such as when Myers is stalking Laurie that are all the more creepy for having no music. Whereas later films and directors would rely more and more on music to create atmosphere and terror, Carpenter doesn’t rely on it; rather, he uses the music to accentuate atmosphere in moments of intensity. John Carpenter’s excellent direction leads to several spine-chilling shots. What takes Halloween to the very top of its success, though, is John Carpenter’s immaculate direction. Having already proved himself with the excellent Assault on Precinct 13 (1976) (you can see my review of that here), Carpenter takes his talent for building suspense and tension to the 10th degree. He wisely keeps Myers out of shot, in the shadow, or in long distance for most of the film, crafting a genuinely eerie and ghostly atmosphere around his appearance that is missing from most other slasher films of the era. Carpenter also makes use of extensive point-of-view cinematography so that audiences to the film are literally placed in the shoes of Myers as he stalks his victims. Carpenter also utilizes lots of audio of heavy breathing throughout the film, creating a spine-tingling effect. Carpenter’s direction makes Halloween a much, much better film than it has any right to be. His devotion to his craft really shows. It is this that makes Halloween a brilliant horror film and without a doubt the best in the series. Halloween was a massive overnight success, earning $75 million worldwide on a budget of $300,000. That’s equivalent to about $250 million today. Whilst Carpenter would repeat this commercial success once or twice in the 1980s, he is now relegated to the role of the cult director in the public eye. It’s a shame, because his films are always at the least very good and every now and then superb; he’s a director that should be more highly regarded, and Halloween is a prime example of his power as a director. That’s it folks! I hope you enjoyed our look back at one of the most iconic horror films. Next Thursday we will be looking at the first sequel, Halloween II, which was intended to end the series (although that obviously didn’t happen!). See you then for more of The Nights He Came Home!